How In-person Classes at Mind Mentorz Help Develop Your Kids' Cognitive Skills? There are classes and then there are classes that are fun and interactive. Mind Mentorz belongs to the latter class of afterschool programs. The fundamentals of an afterschool institute is the same - a safe and secure premises, essential equipments, mentors and coaches. But where we differ is the way we approach our programs. Here, we believe in collective evolution and all of us develop new skills, learn things, interpret, apply and have fun doing them. One of our major elements we consider as our primal success is the fact that kids love coming back to our classes every week. We have heard personally that they wait to get to classes and participate in our sessions. That is by far the biggest compliment we have ever received. But how do we do this? How can you make learning fun and still substantially develop kids' cognitive skills? Well, here's how! At Mind Mentorz, we foster an atmosphere that kids love. Such an atmosphere sustains interests in kids and help them be at their best phases of creativity, imagination, competitive levels and more. We add interesting and unique ways to keep our programs and classes fun and interactive so there is active participation and involvement from every kid in the program. We also leave space for healthy competition in our programs so kids can realize at a very young age that it is important to know where they stand in comparison to others and how they can bring in their unique identity, perspective and thoughts in their work to stand out. Once we set the stage for competition, we see kids going an extra mile in bettering themselves and even helping other kids in the process. One of the major things that differentiates kids from us is their ability to be creative and imaginative. Logic to them is ancillary and the focus is more on believing their thoughts are true. Innate features like these are what would lay foundations for discoveries and make the world a better place. When kids come up with something unthinkable, we don't buzzkill by proving them wrong. We let them explore the possibilities and nurture their creativity to make their visions true. Our robotics and coding classes help achieve this substantially. When they can say they can come up with an idea to remind them to wear white canvas shoes on Thursdays or just pack their homework notebooks, we let them venture into their ideas. At the root of the most offbeat ideas lie solutions. If the imagination of one kid is so contagious and exciting, visualize a place of 20 to 30 kids envisioning things together! This is the collective growth we are talking about. When kids talk, they don't just talk about cartoons or games. They talk about their moves in chess, the duration within which they solved the Rubik's cube or an interesting project they are working on. When conversations are about ideas, progress and thoughts, how cannot there be space for mental evolution? Well, these are just a few of the ways we stand out. We have our excellent coaches and mentors, who become kids when they are around with them. We also have a tailored program structure designed to make them learn newer life skills. If you're keen on taking a personal look on how we take our classes, arrange for a free class today! Some of the best movies are those that take us on a journey along with the heroes. But some of the greatest movies are those that let us get inside their minds and get a sneak-peek of their thoughts and voices. Hollywood has produced some really stunning movies based on mind games and tricks. As players of Rubik’s Cube and chess, we do enjoy our share of mind tricks and manipulation and perhaps, we could take some pop culture references to better our games and thought processes. So if you are free this weekend, here are the best movies on mind games you should binge on. A revolutionary plot, a breathtaking spectacle – Inception is one of the finest movies to have ever been made. Mot just because of the grandeur of the visuals but the very ‘idea’ itself! Imagine a person using not nukes or bio-chemicals to take down an empire but a simple parasite we call an idea. Who would have thought that dreams could be a medium for alternate universes, dimensions and realities? Every time you watch this movie, there is something new you notice. With all the essential elements, Inception comes first on our list. Indian cinema has been really good of late and movies from independent directors and newcomers have arrived as a sigh of relief. Kahaani was one such movie, where the director gets into your mind to pull off a magic trick that lasts for over 120 minutes. It is only in the end that you wake up to the trick to feel deceived and feel great about it. The movie about a pregnant woman coming to find her missing husband in Kolkata is sure to leave you amazed this weekend. We are sure you would have seen the movie but this David Fincher classic is worth every rewatch. The first time you watch it, it’s Tyler Duren that makes an impact. But trust us, from the second time, it’s the movie’s plot and twists that take up your mind. All about hallucinations and delusions, the movie plays a dirty trick in your mind to top off the climax with a twist. If you have not seen this movie, we recommend you watch it today. Movies based on time travel are meant to be serious and confusing. However, directors take excellent care on their writing to make the concept believable and comprehensible for laymen like us. But there was this one film that really took the best of our intellect – Primer. This is a movie, where protagonists accidentally invent a time machine and their obsession over their creation takes them to alternate realities, overlapping spacetime and consequences that are on the darker shades of light. You would have to watch this movie four or five times to make sense of the narration. We are still stuck in our own light years though! No, we are not fanboys of Nolan. It’s just that these movies have to be included when it comes to mind games. A tale of two rival magicians and their dirty tricks and games to outdo each other finds a spectacle in visual narration through Prestige. References of Nicola Tesla and technologies way ahead of their times, the movie has innumerable moments of awe. Watch for the actors, the performances and the prestige! We are sure after watching these movies, you would want to pull off some of your own tricks on the chessboard. If these movies are intended to motivate players, we would love to share more from our lists. Do drop in your favorite movies as comments as well. The team at Mind Mentorz would like to congratulate Manasvi for securing 6/8 points at the Gunavathi Memorial Chess Tournament U9 Category that took place in Bangalore, held on Oct 22nd, 2017. Manasvi secured 2nd place in the girls category, delivering an overall outstanding performance. As an extended offering, Mind Mentorz has partnered with Gene2Genius. Gene2Genius reveals your child's identity through an all encompassing improvement program, which reveals your childs physical qualities and in-born personality. We initially pick up knowledge into your youngster's characteristic qualities and interests through a biometric capture. In view of this information we outline a report all encompassing the right direction for your child. Dussehra Mini Kids Camp upcoming between Sep 19-29. During the school break, Mind Mentorz will be conducing a Dussehra Mini Camp for children to learn Chess, Robotics, Rubik's Cubing & Coding! This is a perfect opportunity for kids to keep themselves busy and productive at the same time. Congratulations to Sankha Gosh from Mind Mentorz, for placing 4th in the Children's Chess Tournament (U-12 Category). Sankha concluded the tournament with a nearly perfect score, having only 1 loss in the whole tournament. He managed to beat two FIDE Rated players this time during the tournament, which is a huge milestone crossed for Sankha. Welcome to Mind Mentorz Academy! 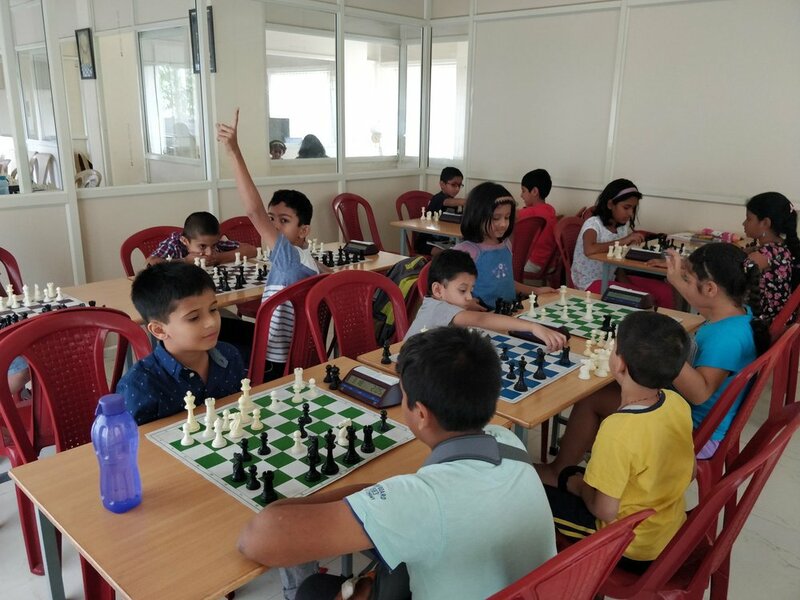 Located at Kalyan Nagar, Bangalore, Mind Mentorz is an academy run by passionate mentors that help children succeed in Chess, Coding, Rubik's, and Robotics. The mentors come with over 5 + years of teaching experience with children of all ages and have immense knowledge in the subjects that they deal with.